All the ingredients you need for pure sport bike pleasure. For those who wish to experience “pure sport bike” and nothing more, UM has created V2S 650. This machine is everything you need and nothing more; pure sport bike fun, handling and excitement with “none” of the fixings. No fairings to get between you and the beautiful 90-degree V-twin power plant. Pure, naked, basic; whatever you call it, with the UM V2S 650 you will not lack for features. All of the ingredients you need for pure, mid weight, 650 cc sport bike pleasure are here. Modern responsive chassis, light weight cast aluminum wheels, inverted forks, super bike handlebars, responsive controls and analog gauges add to the “pure” excitement and pleasure of the sport bike experience. 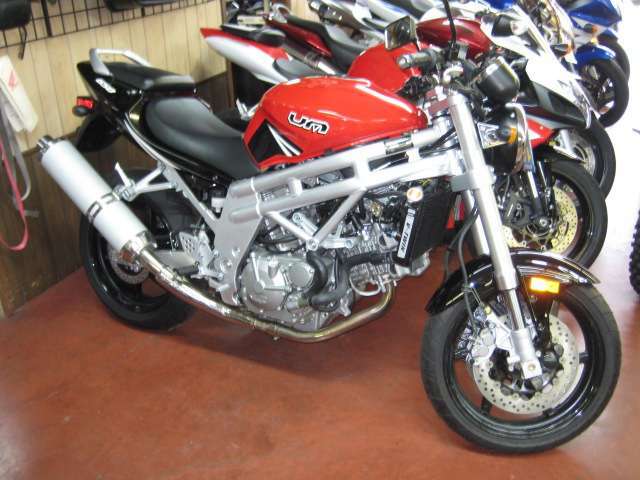 Some will think of this bike as the least expensive mid weight 650 cc sport bike available, and they would be right. Others will use it as a platform for a very individual and unique “street fighter”, still others will see it as a pure and simple canyon carver, some will use it as a track day weapon; and there will be those that will see it as an economical but very fast and agile commuter. The beauty of the UM V2S 650 is that what “you” see is what you get. In the highly individualistic world of motorcycling, The UM V2S 650 is a blank slate for your individuality and creative expression.